The Achilles tendon (tendo calcaneus) unites the three bulging calf muscles (triceps surae) in a tendon, and connects the muscles to the heel bone. 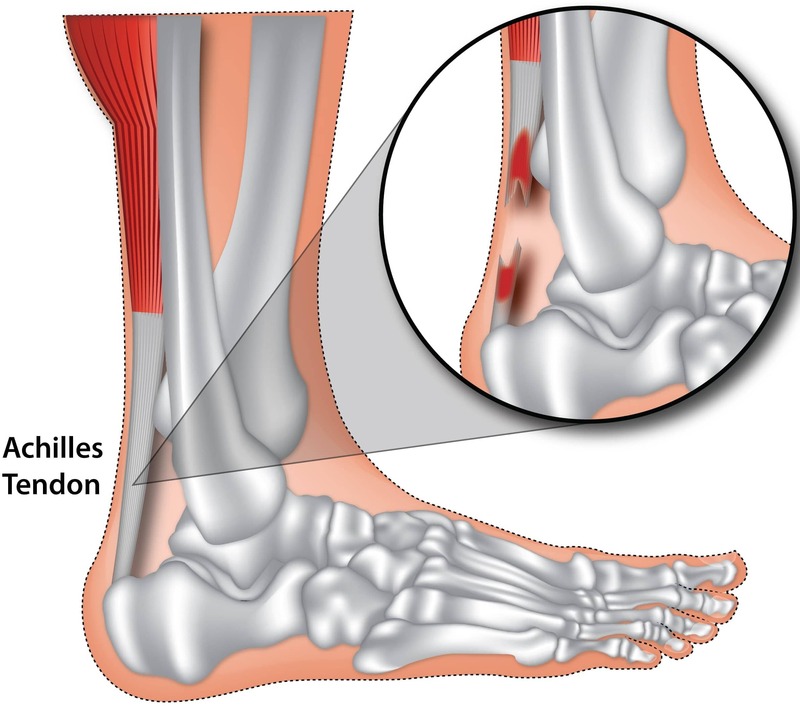 An Achilles tendon rupture is a sudden partial or complete transection of the Achilles tendon. Since the connection between the calf and heel is fully or partially severed, the person will have difficulty using that leg for some time. Even after an Achilles tendon rupture, the affected ankle will still have very limited functionality. Usually it may not even be possible to put strain on the foot or tiptoe again. Due to the strength of the tendon, a healthy tendon will almost never rupture. Most often, the tendon tissue is already damaged: by a persistent irritation or inflammation by micro-trauma (small cracks), which have reduced the resilience of the tendon tissue. When a prior minor injury has occurred to the area, overuse of the tendon during exercise can aggravate the micro-injuries, that coupled with insufficient rest can further weaken the tendon. The tendon can also rupture due to age-related degenerative changes and thus is more likely to be susceptible to weakness. Only very rarely is external brute force reason for an Achilles tendon rupture. An Achilles tendon injury is usually accompanied by a clearly audible, whip-like noise. The injured person often feels immediately when the tendon is torn due to a painful sting or shock in the area of the calf or heel. In football, the injured person may think an opponent has kicked him in the heel. Usually, as a result of the tendon rupture, the toe cannot be bent downwards although standing or walking are indeed still occasionally possible but in pain. Rotation of the ankle or toes is now also no longer possible. A clinical professional will use their finders to feel for a palpable dent at the tendon transection. Additionally when prompted, the patient will not be able to stand on their tip toe. The Thompson-test checks the movement and operability of the Achilles tendon. For this process, the patient is laid in the prone position on the examination table, with his or her feet protruding beyond the edge of the couch. The examiner then compresses the calf muscles, if the Achilles tendon is intact then the plantar foot can be extended downward (plantar flexion ). The test would thus “Thompson-negative”, if the calf compression causes no motion in the foot then there is an Achilles tendon rupture/injury. This is usually carried out if an ultrasound does not provide a full overview of the injury, or if there are unexplained findings in the initial x-ray. An MRI scan can help to accurately assess the quality of the tendon and is useful for accurate operational planning also. This is usually common in elderly patients and those with comorbidities. Here, the calf is fixed with a splint, special shoe or cast for 4-6 weeks. These methods are also useful for those suffering from equinus (tight calf muscles/achilles tendon) which often increases the risk of Achilles tendon rupture. These conservative treatment methods, help in bringing the foot gradually into the normal position as the tendons heal together. After about four weeks, the sales increase will be reduced by 1 cm and after six weeks by a further 1 cm. The shoe/cast is usually worn six to eight weeks. Return to sporting activity is usually between 13-16 weeks. Surgical treatment is usually preferential for younger and physically active patients providing a lower risk (2-3%) of re-rupture as compared to 2-8% for conservative therapy. Wear good fitting shoes, adapted to your sole and feet for reduced stress on the heel and feet.